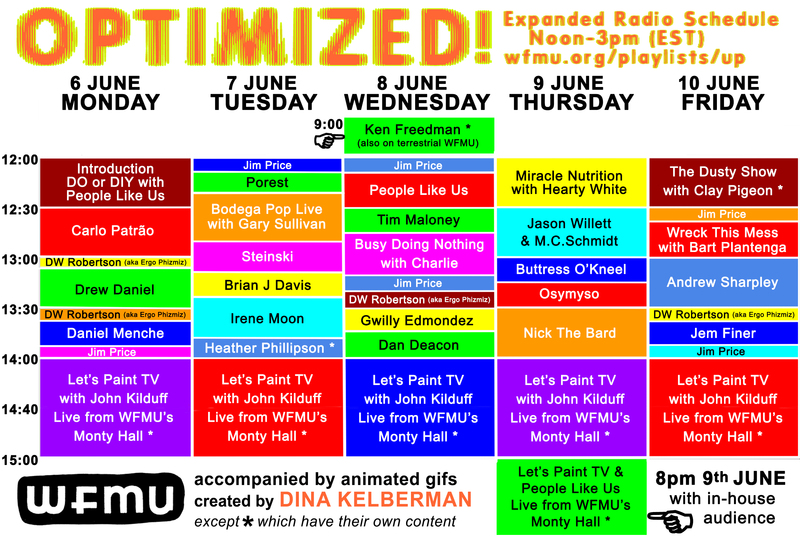 From 6-10 June 2016 Vicki Bennett and John Kilduff were Radio Artists in Residence at freeform radio station WFMU. This online radio residency consisted of "Optimized!" - a week-long online a/v radio station which experimented with ideas of what radio might be in the world of high speed internet broadcasting. The content included 26 new a/v artist commissions selected and programmed by Vicki Bennett, where people were invited to respond to the word "optimized", John Kilduff's live "Let's Paint TV" daily video show which combines, painting, cooking and exercise, and an evening at the station with an in-house studio audience.